The Politics of Global Supply Chains analyses the changing politics of power and distribution within contemporary global supply chains. Drawing on over 300 interviews with farmers, workers, activists, businesses and government officials in garment and coffee sector supply chains, the book shows how the increased involvement of non-state actors in supply chain governance is re-shaping established patterns of global political power, responsibility and accountability. These emerging supply chain governance systems are shown to be multi-layered and politically contested, as transnational governance schemes interact with traditional state governance arrangements in both complementary and conflicting ways. The book’s analysis of changes to the relationship between state and non-state actors within transnational governance processes will be of particular interest to scholars and students of globalisation, global governance and regulation. The Politics of Global Supply Chains also suggests some practical ways by which the effectiveness and accountability of supply chain governance could be strengthened, which will interest both scholars and practitioners in fields of global business regulation and corporate social responsibility. Conclusions are relevant to the business and civil society actors who participate directly in non-state governance schemes, and to state regulators whose distinctive governance capacities could play a much greater role than at present in supporting transnational, non-state governance processes. Kate Macdonald is Lecturer in the Political and Social Sciences at the University of Melbourne. "Marrying theoretical and empirical analysis seamlessly, this book skilfully deciphers the increasingly complex world of supply chain management and politics. It is essential reading for scholars, activists and policy makers concerned with business regulation, changing patterns of transnational governance and the appropriate roles of public and private actors in crafting a more just economic system." "Global supply chains play an important role not only in the world economy but also in global politics, and no one interested in them can afford to ignore this landmark study. Kate Macdonald's ability to combine rigorous and enlightening analyses of global trends with invaluable insights into local processes and experiences, gathered through painstaking fieldwork over several years, is truly impressive." 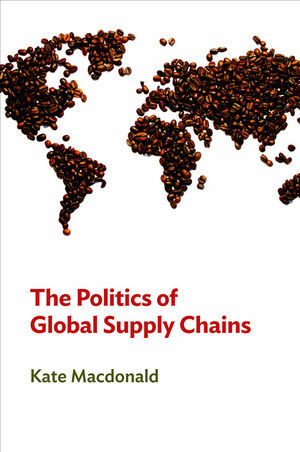 "Macdonald brings alive the politics of supply chains, using rich case analysis to identify – and question – key production and regulation practices in today's global economy. Thorough research yields helpful insights for theorists and activists alike."